I was preparing smoked beef ribs for a meal with family and friends who were coming to visit for a couple of nights, and wanted something light and refreshing to accompany them. I had originally thought I would make a coleslaw, then started playing around with the ingredients. In the end the cabbage was omitted totally and this is the slaw that I come up with. While it was delicious that night and the next day for lunch the flavours had developed and it reached a whole new level. 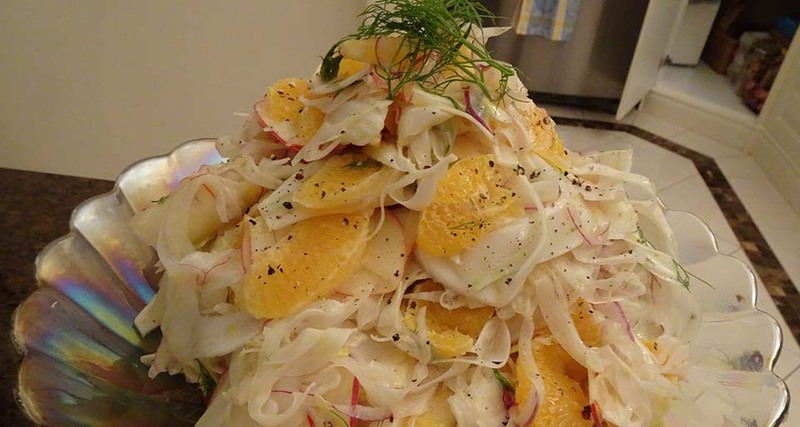 So if your are going to make it, try making it the day before you need it…"
Remove the stalks and the outer layer from the fennel, reserving some of the fronds from the stalks. Cut the fennel in half and remove the core. Wash the apples and cut in quarters, then, remove the core. Peel the oranges and segment or slice them, place the orange into a large bowl. Thinly slice the fennel, apple and onion using either a mandolin or a food processor with the slicing blade, (I used a mandolin), and place into the bowl with the orange. Prepare the dressing by placing the ingredients into a screw top jar, screw on the lid and shake vigorously to combine. Check and adjust seasoning. Pour the dressing over the salad, add in most of the fennel fronds you set aside, and gently toss together to combine. Transfer the salad to a serving dish and garnish with the remaining fennel fronds. I used my Blood Orange Vinegar, for the dressing, but believe that the white balsamic would be a great alternative.